When an SUV’s starting price is around $63,000, it’s hard to think of it as a bargain. One thought when driving this one, though, makes it feel like a steal. That’s the recurring impression I had when driving the Durango SRT 392, the high-performance version of Dodge’s roomy family hauler. Perhaps with the exception of snob appeal, the Dodge offers everything the German super-SUV does and then some, starting with raw power. A massive, 6.2-liter HEMI V8 engine roars with 475 horsepower, making it the fastest three-row SUV in the world, Dodge claims. The National Hot Rod Association certified its quarter-mile time of 12.9 seconds, a remarkable feat for a vehicle that can haul a soccer team. Its power and speed both beat the $83,000 Porsche Cayenne S. You can go faster in a Cayenne Turbo with its 541-horsepower black magic under the hood, but it also starts at $124,600 — about twice the cost of this nearly-as-fast Dodge. That’s how it starts to look like a sale-rack bargain. 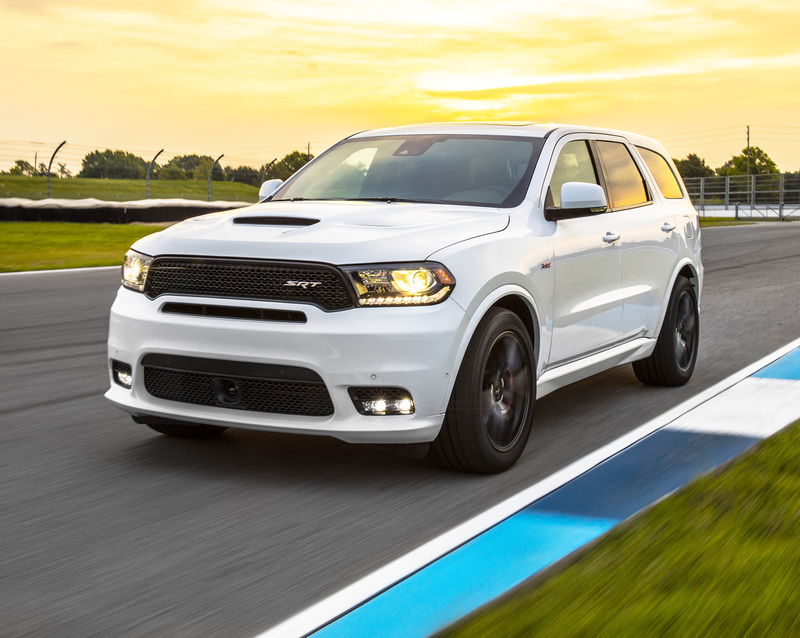 A menacing hood scoop offers a hint of the power lurking in the Dodge Durango SRT 392. It’s an incredibly fast, track-capable vehicle that happens to come with three rows of family-friendly seating. As much as I enjoyed the deeply satisfying rumble and mind-bending torque from the big, American V8, it actually wasn’t the most impressive thing about the SRT Durango. That would be the way it handles. While a number of SRT products, including the Challenger Hellcat, feel designed primarily around going fast in a straight line, this one is an exception. It’s tuned to take corners like the best of its European competitors. For starters, it has an active damping system that opens and closes valves to improve its handling or its ride comfort, depending on what the driver selects. There are seven different driving modes ranging from the track setting that delivers crisp suspension response, 160-millisecond shifts and 70 percent of its power to the rear wheels, to a comfort setting for the street that makes it ride like Grandma’s Cadillac. The guts of its suspension were upgraded, too. It has stiffer springs in front and back and a stiffer rear sway bar, but the brilliant ride tuning and active damping mean it doesn’t sacrifice ride comfort at the same time. It really is one of the most well-sorted, wide-ranging, confidence-inspiring suspensions I’ve ever experienced, and not just in an SUV. That confidence was boosted by sticky Pirelli P Zero three-season tires on my tester, a $595 option. Red leather seats are an option in the wild, powerful Durango SRT with its huge, 475-horsepower HEMI V8 engine. While it feels perfectly at home on a track, it’s also got the ability to handle more mundane duties. Ample cup holders, storage bins and gigantic dual DVD screens in my tester give it a family-friendly side that very few 475-horsepower vehicles can match — and certainly not at this price. And that brings us to the big question: How many people will spend $63,000 — more than twice the Durango’s base sticker — for an American vehicle that takes on Porsches and BMWs? It can’t be a huge number. Dodge’s decision to not only build this vehicle, but also execute it so well, speaks to two things. It’s committed to being a world-class performance brand, and it’s building ordinary vehicles with the backbone to handle a lot more speed. It’s the fastest and most powerful three-row SUV for sale today. It’s tuned beautifully for the track, but its adjustable damping allows for comfort on the road, too.